When a child is born we expect them to be welcomed into the world by celebration. But what if this was replaced by sympathy? For the parents, for the child and their assumed lack of future prospects? This is the reality for the children brought into the world with three copies of chromosome 21 rather than the standard two – those with the genetic disorder Down’s syndrome. Take my service user and friend, Anne. From her first breath, there was an assumption that she and her family would struggle through life and that she would be unhappy. How could she be happy, being disabled? People see the word ‘disabled’ as synonymous with incapable which, of course, is wrong. The only unhappiness that I have seen in Anne has been caused by our incapacity as a society to create activities that accommodate her, causing her to feel isolated. Like any other 19-year-old she is searching for fun, independence and – most importantly to her – love. To assist with this, her parents hired me to be her companion, with the job title of ‘Personal Assistant’. They feel they have to pay someone be a companion because society has not welcomed her naturally. Anne would begin her days with college where she would learn ‘life skills’ such as how to set a table, how to tell the time and how to count money. She often questioned why she was practicing mundane activities when most other people her age were learning about plays and had choice in what subjects they took. (She knew this as she’d had a taste of mainstream school up until the age of 12, when her peers seemed to outgrow her and began to bully her for the differences she showed, so she left.) After life skills I would go to lunch with her at Pret and she would always choose a coffee, adamant any other beverage would contradict her status as an adult. I then would accompany her to her poetry lesson. She loved this; she chose to do it. 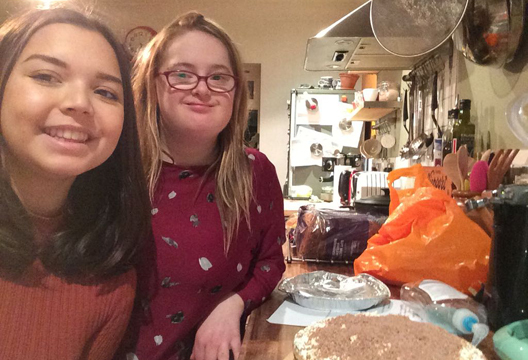 Studying psychology helped me with Anne: without this basic understanding of what having Down’s syndrome means for an individual, it would have been easy to underestimate Anne and her abilities. It also allowed me to be aware of other health issues that are more prominent in those with Down’s syndrome, such as hypothyroidism and anxiety, and better support her around these problems. However, there are a lot of things university couldn’t teach me. I have seen that the textbook definition of Down’s syndrome could not be used to predict what Anne will be like on a day-to-day basis. It has provided me with insight about how being a psychologist means you have to use a person-centred approach to provide the best care possible. And I’ve moved beyond lecture material around total communication approaches for people with learning disabilities to actually learning some Makaton (simple sign language commonly taught to those with a learning disability). This was not my first ‘support worker’ role. For many years I helped with the care of my grandmother, who was diagnosed with dementia. She went from an independent, sassy 90-year-old to someone who struggled to remember where her toilet was and was dependent on a routine set by my mother to get her through the day. This is something that one in six people over the age of 80 live with. They begin to forget the names of common objects, they find it hard to orientate themselves and by the late stage of dementia they often require 24-hour care and have problems recognising people. Yet it would be unfair to say that the negative impact of dementia is inevitable, all-encompassing and universal. At times with my grandmother it provided access to a whole new world of fun possibilities, and in a lot of cases it can bring families together. As with Anne, I have learned that just because people have drawn the short straw in some ways, their lives are not futile, joy is not forever out of reach. We need to stop seeing those with disabilities as ‘other’ and come to terms with the fact that each and every person has their own set of limitations. It’s just that with Anne and my grandmother, their limitations are out of their control and their access to a full life is dependent on other people accommodating their needs. Now, imagine the turn your life would take if you had Down’s Syndrome and you were then diagnosed with dementia. Before I took on a role in assessing older adults with Down’s syndrome for dementia, I had no idea that this was a common occurrence or that being born with Down Syndrome increased your chances of dementia. Chromosome 21 is responsible for the production of amyloid precursor protein which causes a build-up of neural plaque in the brain leading to dementia symptoms. Dr Karen Dodd has shown that the individual with Down’s Syndrome tends to have a faster and steeper cognitive decline than non-Down’s Syndrome individuals. This is an increasing societal issue. Between 1931 and 1935 the average age a person with Down’s syndrome would live to was 11-years-old. In 1980 that age rose to 54 years and is still rising. It is assumed that this is due to advances in medicine and increased knowledge on how to lead a healthy lifestyle. Due to the speed at which life expectancy is increasing, there is a lack of knowledge on how to treat age-related diseases. ‘Anti-dementia medication’ to slow the process has only been shown to be successful in 1 out of 3 people, and critics suggest the improvement is actually due to the fact the individuals on such medication are monitored more closely and offered more support. There is also evidence that shows if an individual stops taking the medication their cognitive ability drops to the state it would be at if the medication had not been taken in the first place: actually a worse outcome, as the symptoms do not appear gradually as they would likely have done naturally. Despite the lack of a cure for dementia there is a tremendous amount of information on how to live with dementia. One thing I realised when giving an individual with Down’s syndrome the diagnosis of dementia was that they were already at a point where their life was already being negatively impacted by the disease… perhaps they were then not so receptive to advice around improving their lives. So how should we go about telling an individual they have dementia? It’s hard enough to accept this diagnosis without any learning disabilities, let alone when they struggle to understand the concept of it. We attempt to explain this to them in terms of their ‘brain not working properly anymore’ and hope that their care provider will change their environment to accommodate this disease. However, now this person belongs to two minority groups, their access to social activities becomes near to impossible and specialist care is needed more than ever. The more I work with assessments of dementia, the more I see the need for transparency. The more people that know about the correlation between Down’s syndrome and dementia, the more we may reduce feelings of isolation, and the ability to lead a dignified life will remain. We need to start looking at dementia as a disease just as serious as we do cancer, where screenings are put in place for those we believe to be the most vulnerable, and changes are made to help them live the life they deserve to lead. Carrying out these dementia assessments showed me how important research is for clinical psychologists. Without the work of Dr Dodd, cognitive decline in older people with Down’s syndrome may not be recognised as dementia, meaning they may not receive the correct support, if any at all. Working alongside a researcher who is driven by the real-life implications of research has given me a more integrated view of research. I have also learnt how communicating within a team is so important – it promotes the standardisation of how assessments are carried out, as without this a correct diagnosis will not be given. During these assessments I tend to visit the service user in different environments: their care home, their day centre and sometimes their family home. From this I have gained insight into how the NHS works to support individuals with learning disabilities by providing them with a variety of activities and opportunities to socialise and sustain healthy relationships. I have also gained insight on how psychologists use multi-disciplinary support groups to provide holistic therapy for the individual. From these home visits I would sometimes be presented with challenging environments to work in, where the standards of care were poor. I’m now less naïve around how varied the quality of care can be. I’ve also seen, through how the role of our dementia assessment team evolved, how the field of psychology is constantly changing. To be a successful psychologist you must have the passion to seek out and take in these new discoveries. It’s more than being able to diagnose and treat individuals – you have to think critically about the way the service works. I would urge my fellow students to apply for placements, as I have gained experiences that university could never teach me. I have a newfound professionalism from working in a clinical environment, confidence in knowing and using terminology I have learnt. I have seen first-hand that a lot of vulnerable people are not given adequate care, but also that a lot of vulnerable people are when they are supported by passionate people who use a holistic approach.